I may not have been able to cross off Italy off my travel bucket list yet, but this doesn’t deter me from closing my eyes and pretending that I am there as the tantalizing smell of Italian food wafts in the air in my kitchen! I love different kinds of food, but Italian food remains as one of my top favorites. This recipe for the Vegetable Primavera with Spaghetti Squash is inspired by the comfort food that I have always loved. The Vegetable Primavera with Spaghetti Squash is just as delicious as it is healthy with a variety of savory herbs and vegetables, but the secret lies within the sauce that gives it that Italian flavor. 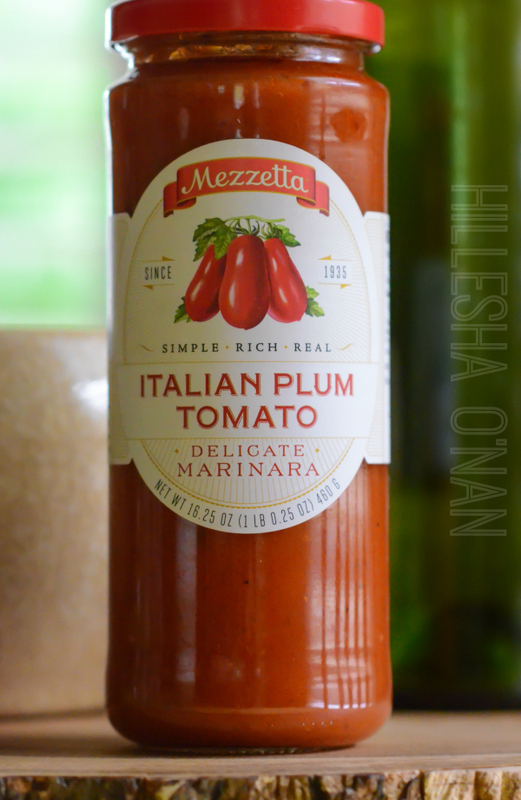 This sauce is no other than Italian Plum Tomato Marinara by Mezzetta. Mezzetta also offers six other different kinds of marinara sauces (Caramelized Onion & Butter, Truffle, Porcini & Cream, Whole Garlic & Sweet Basil, Parmigiano Reggiano, and Calabrian Chili & Garlic), but the Italian Plum Tomato was the best contender when creating the Vegetable Primavera with Spaghetti Squash. The Vegetable Primavera with Spaghetti Squash is the easiest way to have a taste of Italy at home without a passport! One winner will be whisked away for an 11 day guided “Country Roads Puglia & Neapolitan Riviera” tour of iconic Italy! This includes a round trip coach airfare for 2, hotel accommodations, hands-on cooking class including meal, a tour of a tomato farm in San Marzano, and more (valued up to $12,190). Remember, you can’t win unless you enter! The sweepstakes can be entered once every 24 hours until October 15th. ■ Slice spaghetti squash in half lengthwise, scrape out seeds, place it upside down in water in a microwave-safe bowl, and cook for 15 minutes. ■ Use a vegetable spiralizer to cut the zucchini and yellow squash. Set aside. ■ Finely chop the herbs (thyme, basil, oregano, and rosemary) and garlic. Place the Mezzetta Italian Plum Tomato Marinara in a small pot and heat it with the fresh herbs and garlic. ■ Use a sharp knife to remove the core, seeds, and sides of the peppers. ■ Roast the mixed mini sweet peppers over high heat. 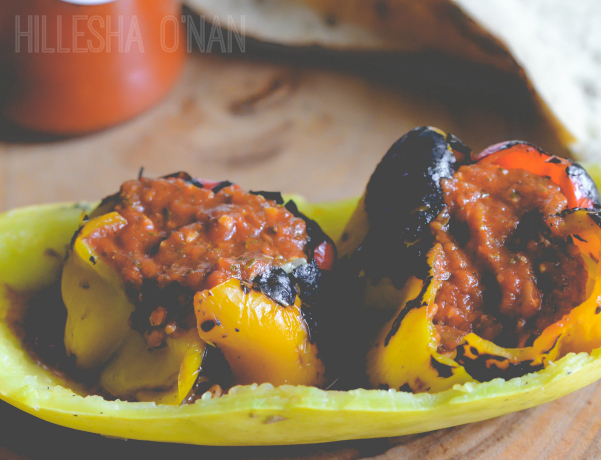 Rotate each roasting pepper with tongs. I roasted mine over an open gas flame. ■ Scrap out the inside of the spaghetti squash with a fork, line the bottom with Mezzetta Italian Plum Tomato Marinara, and use a fork to twirl ¼ of cut of the spaghetti squash onto the plate. ■ Twirl ¼ of cut yellow squash place on top of spaghetti squash. ■ Twirl ¼ of cut of zucchini and place on top of yellow squash. ■ Using a rubber spatula, place the cut spaghetti squash, yellow squash, and zucchini on top of the marinara sauce inside the spaghetti squash. 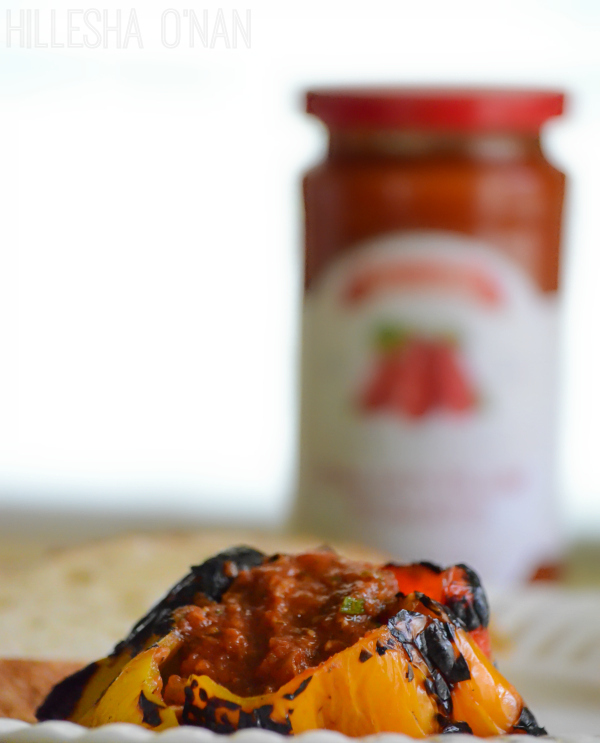 ■ Place the mixed sweet peppers around the side and top with marinara sauce. 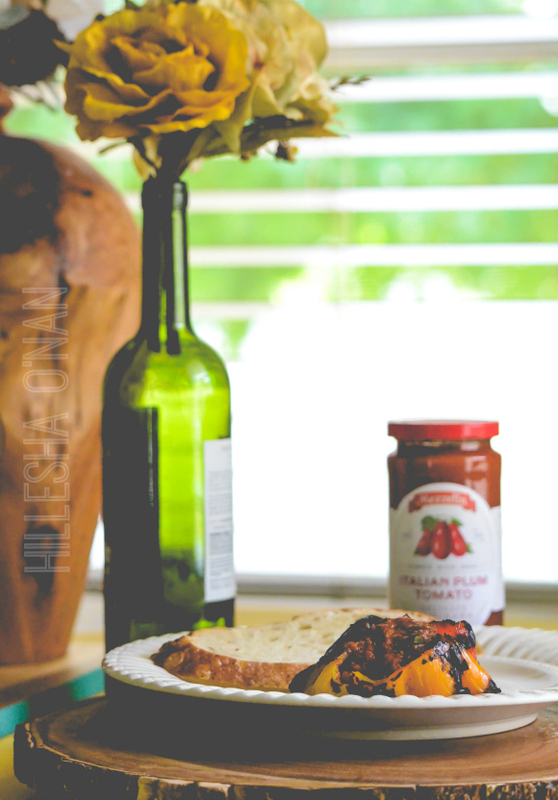 This post is sponsored by Mezzetta, but my love for their Marinara products is all my own! I love spaghetti squash! That sauce looks great too. I make my own but like having a few ‘jars’ for those nights I just forget to take our own out of the freezer or too lazy to make a new batch, nothing like the taste of summer in middle of winter! My favorite Italian dish is stuffed shells YUM! My favorite Italian dish is lasagna, but this looks so good and full of veggies! My fave Italian dishes include meat! haha… Like, the bolognese is one of my top choices! I want to try your dish, because I would love to improve with cooking squashes! Perfect for the fall season, too! This looks refreshing and delicious! Will definitely be trying this! That sounds so yummy! Spaghetti squash is one of my favorite squash varieties. This sounds like a great recipe, and it sounds really easy to make, too. We haven’t had spaghetti squash in ages! I had totally forgotten all about it to be totally honest with you but this vegetable primavera is going to have to be served this week for sure! This dish looks delicious! My favorite Italian dish is chicken parmesan! I have visited Italy before, but would love to go back. My favorite Italian dish is actually kind of different. I love lasagna but I like spaghetti squash lasagna better than the regular stuff. That looks amazing. Spaghetti squash is one of my fav things to make! This looks wonderful! What a great flavor combo! I really need to learn how to make more with spaghetti squash. This looks seriously amazing. Spaghetti squash is a huge hit in our house. I will have to give this recipe a try! This looks so good!! I love a good Italian dishes, I don’t think vegetable primavera is something I have had before. well that looks fantastic! I’ll have to try this recipe out : ) yum! Vegetable primavera is such a wonderful dish! We love a simple caprese salad in the summertime with fresh basil from the garden and heirloom tomatoes. I am really trying hard to avoid carbs and it is so hard because I love pasta. I have been looking for a great spaghetti squash recipe to help me mimic my favorite pasta flavors so I will definitely check this out! This is a fantastic recipe! I would have to add some meat to it – but I want to make this ASAP! Rachel Langer recently posted..Couch to 10K Week 1 Review – The Week of WHAAA??? I’m all about veggies. This looks delicious! That sauce looks yummy. I love Italian food! My favorite Italian dish is eggplant lasagna. I love Italy and one of the best things about it is the food. Thanks for sharing this incredible sweepstakes. Best wishes to everyone who enters as this looks like a trip of a lifetime! I love spaghetti with a fantastic marinara sauce. The sauce can be simple, but it has to be of homegrown tomatoes and fresh basil! I love veggie lasagna, gnocchi, and penne all vodka. A trip to Italy would be divine. It’s on the top of my bucket list, though I haven’t made it there just yet. Oh goodness, this veggie primavera looks wonderful! I love trying new, delicious recipes, and this one looks like something I’d love! Thank you so much for sharing!! Using spaghetti squash is awesome, I didn’t think of doing that before. It’s definitely a healthier alternative to pasta! I’m keeping this recipe! I have not had a holiday in four years so I would love the chance to go to Italy and I entered! Fingers crossed I win and this is a delicious sounding pasta dish too! This looks so easy and delicious. I’ll be adding this one to my go to quick meals when I’ve had a busy day. This looks so delicious and easy to make. I love spaghetti squash and am always looking for new recipes. I don’t cook spaghetti squash often enough – I so need to give this a try! Thanks so much for sharing. I love Italian food, but I haven’t tried Vegetable Primavera with Spaghetti Squash yet. I can’t wait to try this because I love vegetable dishes. I love spaghetti squash! We grew it in the garden a couple years ago, and it was a huge hit! I think my favorite italian dish is sausage peppers and onions over rigatoni – is that italian? It is delicious regardless! This sounds so delicious. I’m not normally a fan of squash, but am trying to eat better. I made a different version of squash as spaghetti – and it was so delicious! I have never tried spaghetti squash, but I keep seeing amazing recipes for it. I gotta try this! I gotta admit, the primavera looked good, but the win a trip to Italy part is what sucked me in. Now you got me all excited. I’ve been using spaghetti squash a lot more since I went low carb. This Italian could never give up her pasta meal and use the squash means I can make a healthier version and still use a great sauce and some fresh Parm. I have too many dishes to count! I love Italian food and this sounds very good. I usually add some form of meat, but this sauce looks like it will be amazing. This looks super delicious! You just gave me an idea what o make with my squash here at home. This spaghetti squash looks delicious, full of veggies! My favorite dish would have to be gnocchi. I’ve been to Italy before but I would love to go back! Such a great promotion and recipe and connecting with your audience. I’m learning from different bloggers and these tips really motivate me. I loved your recipe, looks easy to make. Must try!! Omg I just love spaghetti squash!!! Your recipe looks pretty easy too. I will have to give it a try. My favorite Italian dish is lasagna, but I can’t wait to try your recipe! I’ve never had spaghetti squash before, but this looks so yummy!! I’m a sucker for Italian dishes! This is a dish I would love. Spaghetti squash is one of my favorite vegetables and I love primavera sauce too. This looks like such a delicious dish but I don’t think we have Spaghetti Squash here. Can I use another kind of squash?